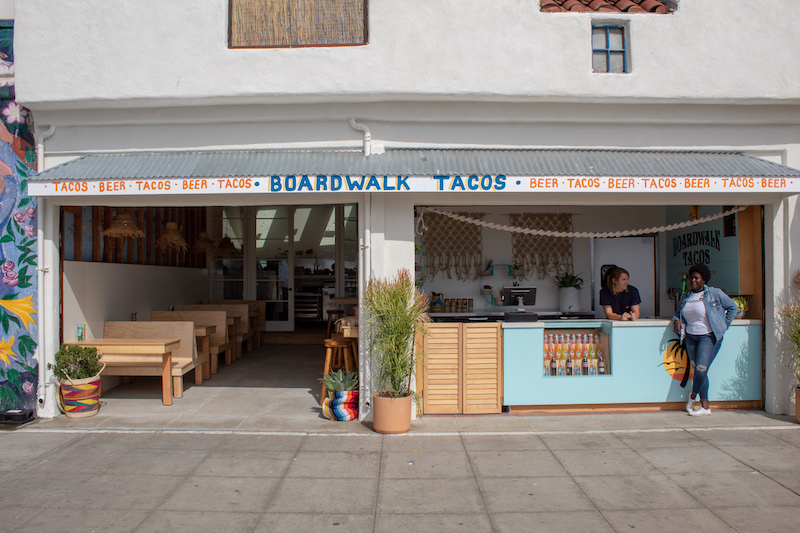 There’s a new (old) spot to get an espresso on the Venice Boardwalk, and while you’re at it you might grab a taco or two. For the past 25 years, On The Waterfront served as a staple in the local community, offering a laid-back hang with plenty of open patio seating out front. That is, until it closed its doors in 2017. Since the closure, the location has found new ownership, and will be officially reopening tomorrow with a new name: The Waterfront. 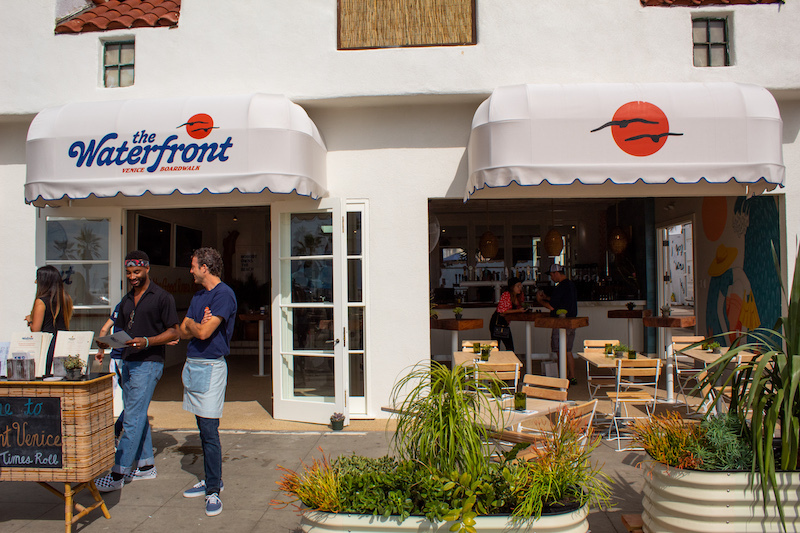 The Waterfront aims to keep the same feel for locals that supported the establishment’s previous iteration, while adding in a few key updates. Walking in, you will immediately notice a multitude of spaces to relax at. 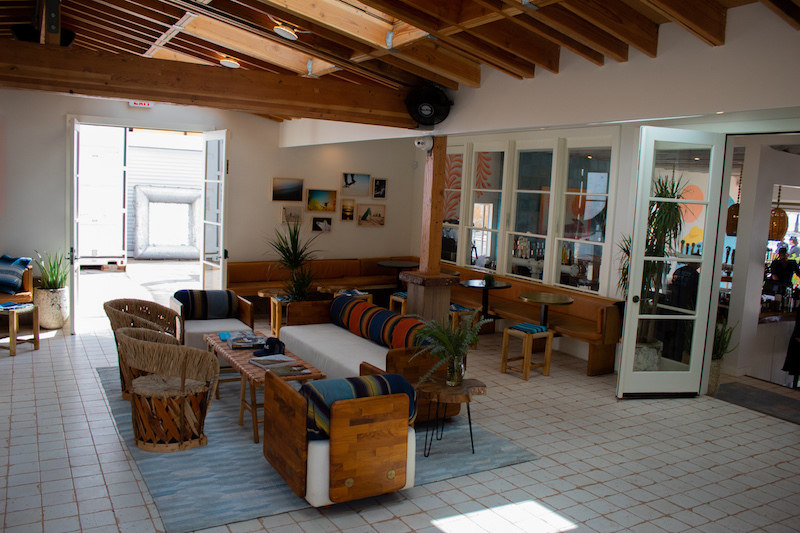 If you’re just looking for a drink you can be served in the front main room with plenty of standing table space, or take a seat in one of the many couches at the lounge house in the back. Off to the right a beer garden stands with table tennis, shuffleboard, and additional seating space. To the left, a modern outdoor patio where food is served. 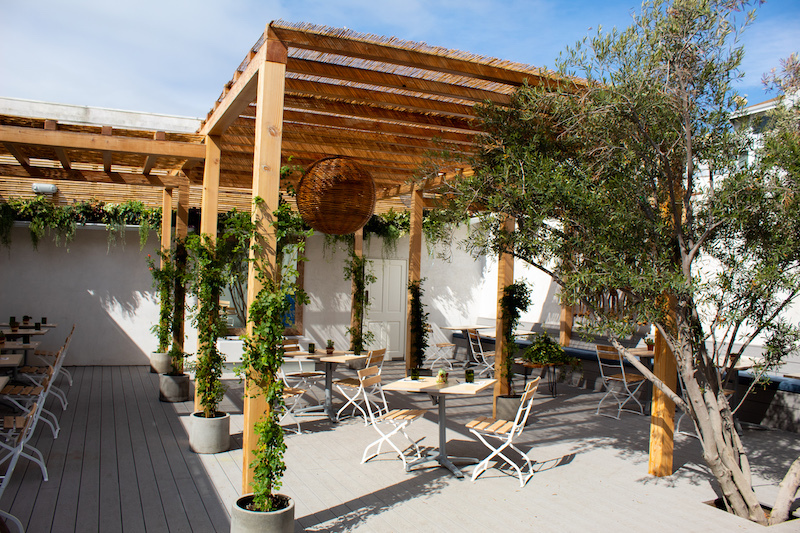 Then there’s the outdoor patio space out front, a spot to enjoy your meal combined with an ocean breeze and a very lively Venice Boardwalk. In terms of food, the menu has been thoroughly built out. Old favorites such as lighter sandwiches and a warm pretzel remain. Additionally, guests can now enjoy a full brunch menu including huevos rancheros, gluten free waffles, or eggs benedict. Once it hits lunchtime, the menu flips to offer burgers, fish and chips, tacos and more. Perhaps the largest addition to the cafe is the massive lineup of refreshments, which include a wide selection of wines, specially crafted cocktails, local beers (draft, canned and bottled), juices, espresso, smoothies, teas and much more. Two of the biggest changes The Waterfront has made are right next to the main cafe. Firstly, there’s a to-go counter, which offers morning espresso, breakfast sandwiches, pastries, juices and other lighter fares, until the lunch menu arrives. You can order online, get a text when your request is ready, and go grab it to enjoy on the beach. Next to this counter is the addition of Boardwalk Tacos, a taqueria that serves Mexican fare from 8 a.m. to 8 p.m. daily and makes its own handmade tortillas. This area has its own seating arrangement and also has its own beer selection, including canned Tecate and Dos Equis on tap. After The Waterfront opens, it will continue to offer a wide variety of regular activities including raffles and surfing boot camp, which enables participants to be provided with soft-top surfboards, head out to the water at 6 a.m., surf shore to shore, and return for a warm shower and espresso. For parking, you can take advantage of their valet in the back of the building with 20 spots – otherwise, you’ll have to use one of the parking lots at the beach (which there is one directly in front of the restaurant), or try a lucky roll of the dice in the streets nearby. A bicycle parking lot will also be available out back. The Waterfront is located at 205 Ocean Front Walk, Los Angeles, CA. The official opening date is October 24. Regular hours are from 8 a.m. to 10 p.m. Sunday through Thursday, and 8 a.m. to midnight Friday and Saturday. For more information check out their official website here.